Custom gripping tools for different electromechanical appliances. An INDEVA® manipulator is the ideal solution for lifting and rotating lawnmowers on the assembly line. INDEVA® industrial manipulators for handling electromechanic appliances such as industrial switches. 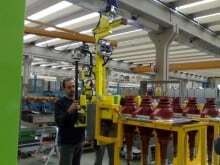 INDEVA® manipulators for manual handling of electric transformers of different shapes and weights.